In this extract from ‘Poor Jack’ by Frederick Marryatt, a Royal Navy midshipman turned full-time writer, we read how young Tom Saunders is taken on board a Channel pilot boat at Deal to ‘learn the ropes’ with his benefactor, Bramble. In the two days it takes to reach Plymouth from Deal, Tom learns the basics. Born in London, Marryatt joined the Royal Navy in 1806 as a midshipman and saw active service in the Mediterranean and Atlantic, rising to the rank of Commander in 1815. His naval experiences inspired and influenced his writing, a career he took up full time in 1830, moving back to London and joining the literary circle of Charles Dickens. 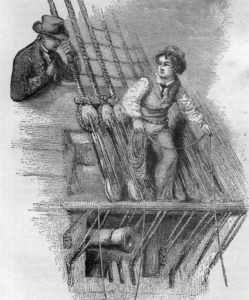 ‘Poor Jack’, published in 1840, tells the story of a street urchin Tom Saunders who, by his own strength of character, becomes a Thames pilot. In this extract, we hear how young Tom is taken on board a pilot boat to ‘learn the ropes’ with his benefactor, Bramble. I had remained at Deal about three weeks when an outward-bound Indiaman anchored in the Downs: her pilot came on shore, and she made the signal for another. It was Bramble’s turn, a galley was launched, and we went on board. The ship was bound to Plymouth, from whence she was to sail with convoy to a certain latitude. The weather was now fine and frosty, and we made sail when the tide served. As soon as we were fairly out in the Channel, Bramble went with me into the main-chains, and showed me how to heave the lead. After several attempts, in which I sometimes would hit the spare topsail-yard upon which I stood, sometimes would nearly break my own head, and once contrived to throw the lead over the hammock-rails in board, I succeeded in getting it round over my head; and when I had once gained that point, I made fewer mistakes. In two days we arrived at Plymouth; and as Bramble kept me at it till my arms ached, nearly half the day, I could by that time heave the lead pretty fairly, that is to say, without danger to myself or other people. The day after we arrived at Plymouth we got into a pilot boat and went out in search of employment, which we soon found, and we continued chiefly taking vessels up to Portsmouth and down to Plymouth, or clear of soundings, for some time. During this time my practice at the lead was incessant, and I became very perfect. When I was not at the lead Bramble would make me stand at the binnacle and watch the compass, so that, by the time we arrived at Deal again, I was pretty competent in those two branches of my art, except that, having practised the lead mostly in deep water, I had not acquired accuracy and expedition in giving the soundings. But I learnt a great deal more of my profession; Bramble explaining to me the sails, rigging, and names and uses of the ropes, and the various manoeuvres practised, all of which he would catechise me in afterwards, to ascertain if I was perfect, and had remembered what he told me. I was, therefore, under excellent tuition. Whatever port we entered Bramble would point out the landmarks to me, state the distances from point to point, and the dangers to be avoided. These I could not so well retain perfectly, and required occasional reminding, but altogether I gave him satisfaction. It was on New Year’s Day, 1800, that we boarded a large homeward-bound Indiaman, which had just struck soundings. She was a thousand ton ship, with a rich cargo of tea on board, and full of passengers, besides more than one hundred invalids from the regiments out there, who had been sent home under the charge of two officers. What a difference there appeared to me to be between the Indiaman going out and this one coming home! the first so neat and clean in her decks, and this so crowded and so weatherworn by her long voyage. What with troops in old jackets, which had once been scarlet, Lascars with their curly black hair, and dark handsome features, yellow men, sickly women, and half-caste children, with their Hindoo Ayahs, tigers, lions, turtles, cows, sheep, goats, and pigs, on the booms and main deck, the vessel was in a strange motley of confusion. As soon as we were put on board, the captain, officers, and passengers crowded round to inquire the news. Bramble, according to pilot custom, had brought off one or two late Plymouth papers (one of which, I recollect, gave the account of the cutting out of the Hermione by Captain Hamilton); but the people on board were eight months behindhand at least as regarded what had passed. They had not even heard of Sir Sydney Smith’s defence of Acre against Bonaparte, or anything else which had subsequently occurred; so that as soon as Bramble had taken charge, and put the ship’s head the right course (for the wind was fair), there was no end to question and answer. And while Bramble was questioned by the captain and passengers, I was attacked by the midshipmen, or guinea-pigs as they are called. Having a fair wind, we ran right for the Downs, where we arrived on the morning of the second day. Here the purser of the ship went on shore with his despatches, and the ship anchored to await orders, by the next post, to go up the river.